Former Argentine junta leader Reynaldo Bignone has been sentenced to 20 years in prison for crimes committed under Operation Condor - a conspiracy between South America's dictators in the 1970s. Many left-wing activists were kidnapped and killed in Argentina, Uruguay, Brazil, Chile, Paraguay and Bolivia. Human rights activists have hailed the ruling. Judges at the court in Buenos Aires announced the sentencing of Bignone, Argentina's last dictator, on Friday. Since the trial started in 2013, five defendants, including Jorge Rafael Videla, the head of Argentina's junta during its first three years, have died. "This ruling, about the co-ordination of military dictatorships in the Americas to commit atrocities, sets a powerful precedent to ensure that these grave human rights violations do not ever take place again in the region," Jose Miguel Vivanco, Americas director for Human Rights Watch, said. 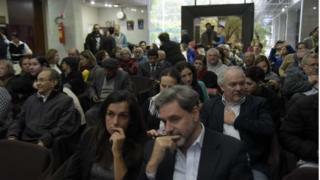 The verdict hearing took place in the largest courtroom in Buenos Aires and it lasted over an hour. The hall was full of survivors and relatives of victims who had travelled from neighbouring countries. A Uruguayan flag was hanging in the hall, marking the first time a former Uruguayan officer had gone on trial for torture in Argentina. The only defendant present was Angel Furci, who was found guilty of illegal kidnapping in 67 cases and 62 cases of torture - for his actions at the Automotores Orletti illegal detention centre. At the end of the sentencing process, families of victims shouted "Presente!" (present), the chant dedicated to those who disappeared. Operation Condor - named after the largest vulture in South America - began in 1975 at a meeting of intelligence chiefs from Argentina, Bolivia, Chile, Paraguay and Uruguay. It later came to include Brazil, and - in a more peripheral role - Ecuador and Peru. The operation, which continued in the 1980s, brought together the military of neighbouring nations that had previously been at war with each other in order to fight a new common enemy - the spread of Marxist ideology throughout the region.